“What we are submitting is the idea that the president should be selected by the majority of people in the United States of America,” Senator James B. Eldridge, an Acton Democrat, said before the Senate voted to enact the bill. But Senate minority leader Richard Tisei said the state was meddling with a system that was “tried and true” since the founding of the country. “We’ve had a lot of bad ideas come through this chamber over the years, but this is going to be one of the worst ideas that has surfaced and actually garnered some support,” said Tisei, who is also the Republican candidate for lieutenant governor. If Patrick signs the bill, it would be a victory for activists who have been campaigning in other states to get similar legislation passed. Supporters say the current Electoral College system is arcane and outdated and causes candidates to campaign in battleground states while largely ignoring the rest of the country. Under their plan, if states carrying a majority of the electoral votes — 270 out of 538 — enact the law, the candidate winning the most votes nationally would be assured a majority of Electoral College votes, according to the Globe. Illinois, New Jersey, Hawaii, Maryland, and Washington have already approved the legislation, according to the advocacy group National Popular Vote. A similar measure passed both branches of the Massachusetts Legislature two years ago but did not make it all the way through the process, the Globe said. Boston.com reports that the Massachusetts legislature is going in through the out door again, passing a law to ignore the will of their people, and instead just give their electoral votes to the popular vote winner nation wide. Tisei also criticized the proponents for not following the normal procedures to seek a constitutional amendment. Abso-effing-lutely. This is what Article Five is about. Understood, there seems to be a psychological joy, which some find, in taking words to mean whatever they wish. Hence the Commerce Clause becoming the Constitution over the last century. Hence the “judicial deference” doctrine, where Congress can emote whatever it wishes, and We The People get to watch the 14-ish trillion dollar debt pile up due to Federal over-reach. Does this state even merit the privilege of having the USS Constitution moored in Charlestown? One hopes the American people grasp that this is one more step down the path of collapse into tyranny. Possibly not a big one, but a step nonetheless, and unlikely to gain much traction in Virginia. 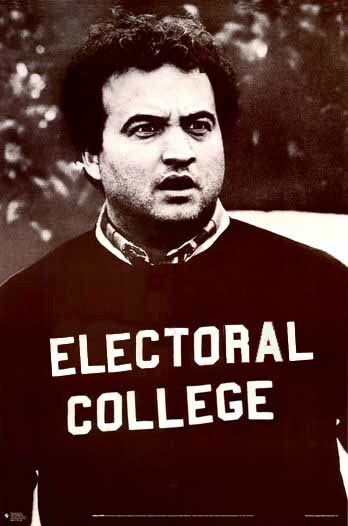 I know that this is remedial for Cornerites, but the electoral college is one of the last vestiges of federalism we have left. It reflects the Founders’ conviction that the method of choosing the Executive should reflect the will of the several states qua states — he’s called the President of the United States, not the President of America. The desire to protect the integrity and discreteness of the states, and to prevent the most populace states from running up the score in the popular vote, was the essence of the Connecticut Compromise. Do away with the college and you might as well abolish the Senate. Not that many on the Left would shed too many tears over that prospect. In any event, there is something of a consolation prize here: unless and until enough states adopt the measure to give it teeth,Massachusetts will wind up serving as a mere rubber stamp for whoever wins the presidency by accruing enough votes in the other 49 states. Which means Massachusetts could realistically go Republican in 2012. . . I suspect that two factors are at work here. The first is an attachment to the status quo and a reverence for American political institutions of all stripes, which is certainly commendable up to a point (the point being a recognition of when the institution has failed.) The second is Republican partisanship — since 2000, many Republicans associate criticism of the electoral college with the delegitimization of the Bush presidency. That is to say, if we admit that the electoral college is unfair, then we admit that Al Gore was the rightful winner in 2000. That’s also an understandable sentiment but not a good basis for defending an ineffective electoral mechanism. NPV commits Massachusetts to an interstate compact, which goes into effect once states holding 270 electors (a majority) have agreed to sign it. Under the terms of the compact, participating states must allocate their presidential electors to the winner of the national popular vote (instead of each state’s popular vote). If this compact goes into effect, theElectoral College will exist in theory, but not in practice. Patrick’s signature will make Massachusetts the sixth state to approve the compact. The first five were Hawaii, Illinois, Maryland, New Jersey, and Washington. New York and the District of Columbia could also soon jump on this bandwagon. The Massachusetts legislature has forgotten (or never knew) the lessons of history that caused the founding generation to create institutions such as theElectoral College . The Founders had an interesting challenge in front of them: How could they encourage successful self-governance in a country as big and diverse as America? They faced two challenges: First, they knew that, as a matter of history, pure democracies fail. John Adams once noted, “Democracy never lasts long. It soon wastes, exhausts, and murders itself. There never was a democracy yet that did not commit suicide.” In such a system, it is simply too easy for bare or emotional majorities to tyrannize minority groups. The Founders’ second challenge came from the vastness of America’s territory: Some wondered how the alternative to democracy, republicanism, would operate in such a large nation. The Founders solved their dilemma by drafting a Constitution that blended three different governmental principles: republicanism, democracy, and federalism. America would be self-governing, but minority groups (especially the small states) would have tools with which to protect themselves from unreasonable rule by the majority. The federalist aspects of the nation would help solve the problem of extending a republic across such a broad swath of territory. The founding generation thought that a nation of thirteen states was big and would require unique solutions. What would they think about a nation of fifty states? The partisan angle mentioned by Chait is interesting. It’s particularly interesting because past efforts to move to a national popular vote were NOT partisan. The last major effort in the 1970s was an overwhelmingly bipartisan effort whose supporters included Bob Dole, Gerald Ford, George HW Bush, Nixon and vast numbers of Republicans (and Democrats) in Congress. The national popular vote movement is itself becoming less partisan as 22 of the 27 voting Republican State Senators in New York recently supported its passage (including 20 endorsed by the Conservative Party). I think that legislators and individuals across the country are increasingly seeing the national popular vote not in terms of partisanship, but in terms of reforming an unbalanced system. In my opinion, it is difficult to defend a system that results in two-thirds of the country being mere spectators to the election of its leader. Campaigns spend 98% of their resources, i.e. advertising, candidate visits, field operations, polling, etc., in just 15 states. If you live in a safe state, whether it is big or small, rural or urban, north, south east or west, the reality is that presidential campaigns don’t care about you. The essence of the national popular vote proposal is that a vote should be a vote. There is no reason why someone living in Ohio, Florida, Pennsylvania, or New Mexico (a battleground state the last decade) should be more important than someone living in Oklahoma, Alabama, or Vermont.